HALLIE EPHRON: Welcome back to WHAT WE'RE WRITING week. First, DRUM ROLL! 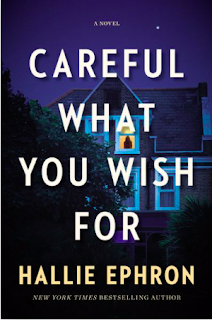 Here's the cover of CAREFUL WHAT YOU WISH FOR, due out in August! What I love most about it is the star. I was a big one for wishing on the first star of the night, never realizing that the first one is usually a planet. Which brings us to today's topic: editing. A week ago I received the copyedited manuscript. What I adore about this stage of writing is cleaning up the nits. Streamlining. Eliminating redundancies. Obsessing over minutiae. What I don’t like is when the editor picks up something that a) makes no sense, or b) Is contradicted by something else that happened in the book, or c) that character would never do that, or d) screws up the timeline, or e)…. I call them plot knots, and working each one out often means fixes that ripple through the book. Working out a plot knot often requires an overnight during which I toss and turn, what-iffing like crazy and taking fork after fork until (usually the next morning when I’m half awake and still in bed) I find one that works. 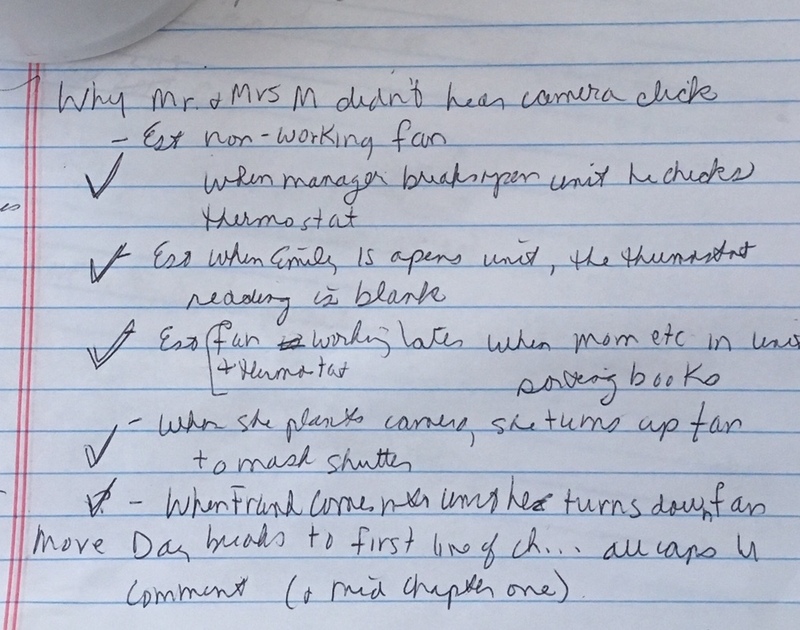 For instance, here’s my next-morning notes for the plot knot: Why didn’t they hear the camera click. Trust me, this is an essential plot twist. The camera in question is an older DSLR with a mechanical shutter, and as the editor rightly points out, the characters WOULD have heard it click. Yet for the story to work, I need them not to. 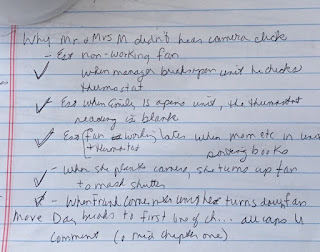 This required fixes in FIVE places in the manuscript (see my list) which I checked off as I made them, and marked the places in the manuscript so I could go back and read them one after the other. Here are some of the easy edits the copyeditor made. (I’m leaving out all the commas I misplaced. Seems like where I put them, they get taken out, and vice versa.) See if you can tell what needs fixing. The edited versions are below. She dumped a load into the bag, then crouch-walked further in. When they’d gotten back the latest test results back a few weeks ago Frank had seemed relieved. Mrs. Murphy held the picture to her chest for a few moments, then lay it facedown on the piano. But she missed and the key dropped onto the concrete floor. Bending over to pick it up, blood rushed to her head. Under the pulsing showerhead, her head cleared. Emily rolled the map back up and slipped it into the tube, anxious to put it back on the shelf where she’d found it. Walter Newell had dark hair and a mustache and beard like this guy, but that was hardly enough to say it was he. She dumped a load into the bag, then crouch-walked farther in. She logged on to her computer. When they’d gotten the latest test results back a few weeks ago Frank had seemed relieved. Mrs. Murphy held the picture to her chest for a few moments, then laid it facedown on the piano. But she missed and the key dropped onto the concrete floor. When she bent to pick it up, blood rushed to her head. Emily rolled the map and slipped it into the tube, anxious to put it back on the shelf where she’d found it. Walter Newell had dark hair and a mustache and beard like this guy, but that was hardly enough to say it was him. How'd you do? What are the kinds of nits that trip you up, reading or writing? Hmmm . . . those were pretty clear. I don’t necessarily try to find those nits when I’m reading, but sometimes they just jump out at me. The book I’m reading on my Kindle now is making me crazy. A whole page of the story written in past tense and right in the middle is a present-tense sentence that begs to be past tense like all the others. Now I’m frustrated because those kinds of things throw me out of the story and, instead of being immersed in the telling of the tale, I feel like I ought to be looking for my red pencil . . . . I agree, it's the kind of thing that pulls you right off the page. "Red pencil" - Were/are you are teacher? Because (the editor in me requires me to point out) an editing pencil is blue. Why? Good question. Anyone know?? Yes to being a teacher. Blue pencils for editing because the blue writing does not show up on most photocopies [and red usually photocopies as black] . . . .
Ah... from the olden days when we printed and photocopied manuscripts. I get caught on a word and use it over and over again. "Just" is a particular pet of mine. Even for a brief comment on Jungle Red, I'll have to go back and pick out the extraneous "justs" so I don't sound like an idiot. "Top" is another that creeps into grant proposals and proliferates like a mother bed bug. I've long since given up on counting commas. I tend to go comma-heavy, ala Chicago Manual of Style, but often run into editors who go all comma-light/AP Style Guide on me. I caught most of the nits in your example, Hallie, but not all of them. I'm looking forward to reading the new book! Ack ack ack! The sound of a writer smacking herself in the forehead. I've never thought of using the search function in that way, but when I have "known offenders" it makes perfect sense. Thanks for the great idea! Got 'em all. I only learned the further/farther distinction a few years ago. I use the #7 structure, too, and have to fix it. Like Gigi, my overused words astound - I fixed dozens of "just"s this week. In some books everybody is shrugging, in others everybody is striding here and there. Can't wait to read the new book, Hallie! Further/farther - I still don't know the difference. From Grammar Girl (I'm a fan!) "The quick and dirty tip is to use “farther” for physical distance and “further” for metaphorical, or figurative, distance." So I guess: "further than she could throw him"
Right. I just think of "far" for real distance, and "I didn't want to take the argument any further." I wonder if Farther is in reference to distance. For example, we need to walk farther. I wonder if Further is in reference to "more" or "future" like in "further notice? I absolutely love this part! And it is where I am n my process, too. To me it’s like a big treasure hunt, looking for the book I meant to write. Every change feels like a triumph. When I teach editing, one of my tricks is to go through and take out all the crutch words first. It’s easy, and fun and rewarding, and gets you reading the manuscript in a different way. Just, of course, actually, even, so, shrugging, grinning. And then I hope I find the words that I have fallen in love with inadvertly, and in every book it is something different. Once it was flickered: everything flickered. Monitors, eyes, glances, TV screens, lights. Oh, and the gestures everyone does throughout. Pursed her lips— you don’t need any of those. I took all of them out. Hurray, Hallie! Cannot wait to read it. And I love the star, too. My characters did far too much shuddering and pausing. I love the star too Hallie! and can't wait to read. Hank, you can't JUST take pursing and flickering and all that out, right? Don't you put something else in?? Well that’s the fun of it! Those words are lazy, and put in almost without thinking, right? (Right? Is another one. ). So when I find one, I think: what did I really mean by that? What am I trying to do or show here? So often I rewrite the whole thing a completely different way. But that’s exactly my technique: the crutch word points me to a place that needs to be fixed. Sometimes you can just take it out, and all the words surrounding it. That's when editing becomes the soap opera: As the Wordcount Dwindles. Didn't get any of them. Must be tired she,said defensively. I deliberately leave out the "I" often, to help me get out of my ego state. Misplaced comma just now. My overused word is So, so.. if you see that little 2 letter critter you will know Coralee wrote it. I *LOVE* "so" - onaccountabecause it's how some people talk. And it implies a kind of attitude - "So, where are you going?" Is very different form "Where are you going?" Oh, Hallie I love this cover! Timelines are my big thing. I never seem to get them right. At least for HEAVE HAS NO RAGE (due Wednesday) I think I caught the big knots early, thanks to a trusted reader. Hank, overused words? It changes with every book. This one was "of course" and "plus." Argh. Liz, I'm with you in timeline hell. Recently I was reading a book by a well-known author--the kind at the top of the reading lists from a big-name publisher--and I was amazed at all the nits that jumped out at me--the easy edit kinds of fixes. There/their kinds, punctuation kinds, repetition kinds of nits. I blame reliance on spell-check for the there/their kind of nits, but for the rest? They do draw me out of the story. A good team--author, editor, copy editor--is priceless--more than one eye is needed to go over a manuscript. 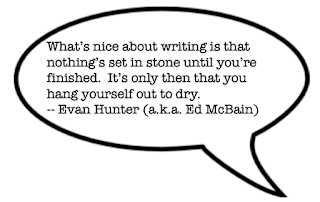 And it takes a special touch on the part of the copy editor to find the nits, but leave the author's voice intact. And Hallie, love your cover--how can it be innocent and creepy at the same time?! Thanks on the cover, Flora! Yes, it does combine those elements. My sweet spot. There's no excuse for those kinds of mistakes from a big-name publisher. Though I knew an author who insisted she was right, rejecting the editor who wanted to change her "rod iron" to "wrought iron." I think the author gets the last word... even when they're wrong. Flora, I have seen that too. It made me wonder if the publication of the novel was a rush job? What a great master class on editing. Thank you Reds! Hallie, as always, I'm looking forward to the knot-free book. I'll pencil it in as my end of summer treat. I *HOPE* knot free. Because sometimes editing away you can take out a knot and the fix introduces a new one... which readers gleefully point it... when it's too late to fix. Ah, the armchair editors, a group very similar to the Monday morning quarterbacks. I love What we're writing week. 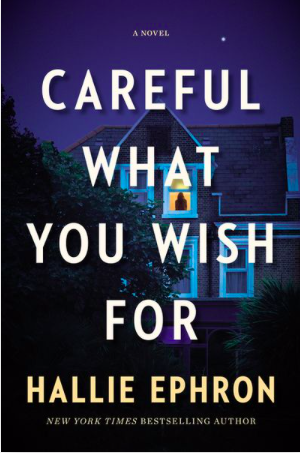 I'm looking forward to reading Careful What You Wish For, Hallie. Because I knew there was something to find, I found almost all . What would have caught my eye otherwise were #3 , #5 and #9. I think that you are very kind and open to have shown us some of your nits and for me, it is really inspiring. Wouldn't it be nice if there were a function that finds repeated words within a sentence or paragraph? And ignored the little words that belong everywhere. Happen. When I searched for happen happened happens I completely went crazy. Great cover! The first star is usually Venus. Just, that, so, up, down (she ran down the stairs), tucked. Shrugged, sighed, moaned. I know written dialogue doesn't duplicate spoken (like, um, you know), but "so" is a good transition word to replicate spoken dialogue on the page. TUCKED! I just weeded those form the garden last night. Tucked. Sigh. It always seems so perfect at the time. Time after time after time. You know the thing that always, always gets me? Squishing two words together. Like woodstove and barcart. I'm drawn to do-it-yourself portmanteau words. I blame my childhood years in Germany. And on the other hand, the ones they make use that don't work. Like faceup. That doesn't even look like a word to me. This squishing thing has me all confused these days. Is it back yard or backyard? Red brick or redbrick? Back seat or backseat? Who gets to decide? Red-brick! When it's an adjective. I'd have had fewer (not "less") corrections to make if I'd been using the dictionary my publisher uses: Merriam Webster. That reminds me. A friend wrote a letter to me and wrote "alot" instead of "a lot". I learned from a teacher that you are supposed to write "a lot". I wonder if it is because when people talk fast, it sounds like alot instead of a lot? When I started my auditory lessons, I remember hearing "how are you?" as "howareyou"
Yes, "a lot" is two words. That's a nit that really bugs me when I see "alot." Now I know "a lot" is two words. I don't mind copy edits unless theCE tries to rewrite for me! A CE should know better, Rhys! A good CE should find the mistakes and typos that we all miss and fix them so discreetly that nothing appears to change, the work just reads more smoothly. But rewrite your sentences?? No way! Rhys and Flora, I agree! I got most of them, armchair editor that I am. However, you must have a very good editor, Hallie, because I don't recall needing to edit your books when I read them. I lay on the bed. But I [what] the dress on the bed. Also is the difference between a direct object and no direct object. But I (put) the dress on the bed. But I (rolled out) the dress on the bed. But I (spread my hands on) the dress on the bed. Not sure if these works. The other one that people always miss is "set" and "sit." Set is for things, set if for animates. You set the table; you sit down. I always take out DOWN after SIT ... and UP after STAND. Yes, I have seen the mix up of sit /set words. I also remember some typos like there / their. But at least now I know what to call them. :-) Thanks for this post! HA HA HA! I'm still working on the edits and *I* need the masseuse. Plot knots! I love it! I have a love-hate relationship with copyedits. Mostly hate. And I struggle with affect/effect lay/lie further/farther - ugh! THRILLED to see the cover and know that your book is coming in August!!! Yay!!! Jenn, I just finished reading the advance copy of WORD TO THE WISE and the plot twist is brilliant! Works perfectly. Can't wait until you can talk about it. Jenn, does affect/ effect sound alike? I will rewrite to avoid some of those struggles, Jenn. Really. There are other ways to say it. Fascinating stuff! I caught many of those errors, but some I had to read a couple of times before I could even see the difference. Love that you used that quote from Evan Hunter. He was my first favorite author. Hallie, great examples of before and after editing. Unfortunately, I have seen too many published novels with errors similar to your before editing list! I know of a self-published author, who published two books out of their own pockets. First book had grammatical errors despite being married to an English professor. The second book was worse, despite having a friend help edit the book. The friend who helped edit the second book was mainly focused on the photo collection for the book. I am sorry to say that the book was So full of grammatical errors! I can see why none of the publishers, except for the self-publishing company who charges the author to self publish the book, wanted to publish the books. The other published novels by other authors with errors were not this awful. I am so picky about grammar. Look forward to reading your novel in August! So excited! Diana, teasing you now: "First book had grammatical errors despite being married to an English professor." I'm picturing a book holding hands with a scholarly fellow wearing glasses. Hallie, LOVE LOVE the cover!!! It's the perfect combination of appealing and intriguing! And sorry to be late, but I got my editor's edits this morning and I've been madly skimming through them before I start to work on the manuscript. My editor is so terrific. My usual reaction to her changes is, "Why didn't I think to say it that way?" Or, "Did I really need all those words?" Her favorite comment to me is, "Show, don't tell." This maybe be EDITS week on Jungle Red! I hate those SHOW DON'T TELL comments... always right, never easy. Hallie, that cover is wonderful! Suspense just oozes from it, and the placement of the title and your name are all perfect. I do love the title, too. The plot knots are fascinating. Knowing that one misstep, such as the sound of a camera, can affect so much more in the story is an intriguing thread to unravel. I enjoy the grammatical editing part, too, but it certainly requires a close reading of another sort than the plot knots. I got most of the edits, but I disagreed with the last two fixes, which I'm sure is just personal preference, not grammatical. I had a problem with the last one, too - Ann agrees so we must be right! About #10, back in the day “he” was correct. Now it sounds stilted although I think still correct. I still say “ it is I.” Hey. I’m really old. However I say Hallie got it right the first time.